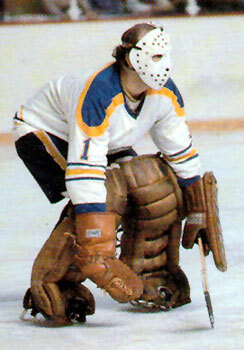 Roger Crozier was a seven year NHL veteran when he arrived in Buffalo to become the Sabres’ first starting goaltender in 1970. GM Punch Imlach knew that solid goaltending would be the cornerstone around which a competitive team must be built and traded with the Detroit Red Wings for Crozier. He gave the Sabres instant credibility, while playing in 44 games in their inaugural season. The Bracebridge, Ontario native started the Sabres’ first NHL game ever October 10, 1970 against the Pittsburgh Penguins and turned away 35 of 36 shots to earn the franchise’s first victory, 2-1. The 35-save effort was actually an easy night for Crozier during that first season. Four nights later, he faced 53 shots as Buffalo was shutout in its home opener, 3-0, by the powerful Montreal Canadiens. During that first season his experience and veteran poise gave the Sabres a chance to win any time he was between the pipes. His early years in Buffalo were marked by games with high shots on goal totals, and he posted a 9-20-7 record in 1970-71 before medical problems forced him out of the lineup. During the 1971-72 season, he turned away 2,190 shots, which is still the team record for shots faced by a goalie in a single season, and was named the team’s most valuable player. Crozier was an acrobatic goalie who challenged shooters with reckless abandon despite his small 5-8, 160-pound body. The young Sabres team was competitive from the start, thanks in large part to the contributions of Roger Crozier. The wily veteran played 202 regular season games (74-76-29 record) for Buffalo, over six seasons, before being traded to Washington in 1977. He finished his 14-year NHL career that season before joining the Capitals’ front office staff. In later years he moved to Wilmington, DE where he rose to the level of executive vice president of Worldwide Facilities and Construction at MBNA Bank and held that position at the time of his death in 1996 at the age of 53. Roger Crozier’s contributions to the Buffalo Sabres organization were honored in 1980 when he was part of the first class inducted into the Buffalo Sabres Hall of Fame. In 2000, the NHL unveiled the Roger Crozier Saving Grace Award given annually to the goaltender who posts the best save percentage in each season.